Finally, we did it! Our Sense 2.5 is finished! 2 months hard work and we created the fastest Sense 2.5 ROM in the "market". Everything is working and everything is smooth. :huh: This ROM is great for the everyday usage. The ROM has a hungarian version, what you can found at the PDAFanClub.com. A Possible fix of the MMS problem - I could not tried. AS and KIES problem fixed (I tried the settings what wes58 recommended to fix this problems). I did not experienced the problem in AS during the 2 days testing. The Manila's core changed to the Rhodium version. It feels a little faster. Big thanx to who's appriciated our work 'till now! 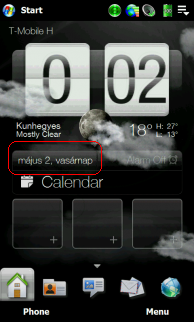 Disable any UI in "Items on Today"
The Sense supports english and hungarian only! You need to mention our names and the donation's link! I must warn you, the Sense maybe not perfect in this way! You'll probably face with crashes and not working functions! I recommend you to use the ROM if you want a perfectly running Sense 2.5. I created an installer from the version of the TouchFlo3D 1.3 what I'm using in my ROMs. The installation method the same as at the Sense 2.5. Seems I can't get this area to appear in english, trying w/no csc and original ij6 csc as well as the one provided in the original post. After reflashing w/out a csc I have no problems with the text there, trying again w/my original csc, then going back to none to see if any other errors pop up. Maybe I was having trouble w/octanes/flashing the wrong csc. Looks like chteditor is semi-working. Crashes sense when I try to change the home layout. Downloading................I am so excited at this moment! Noobody and Rapid, you're our hero! EDIT: just flashed, so amazed!!! will test it now! Thank you! your effort and contribution to us omnia users is without question! Thankssss.. Flashed and booted. No problem at all. Up to now it works well. It really worthed waiting for. WOW, the master's have done it! Downloading now! I was just finding out how to install sense 2.5 using the Sense 2.5 thread. But while searching, this thread show's up. Thnx again for your hard work! 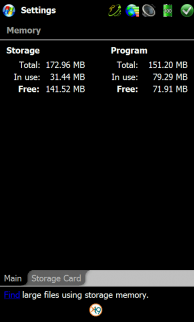 take note guys, the default performance of this rom is at auto, and it is still amazing! i just have a query - how do i unlock the default 'My Internet' data connection. it seems to be locked to t-mobile. it didn't ask for me to save the settings of my local network. Nice rom,1 problem..it freezes when you sync with pc.cannot transfer files from pc to phone.have to remove battery everytime it freezes. This problem was discussed in my other ROM's thread. The solution is to uninstall completely (updates too) then reinstall the Mobile Device Center.